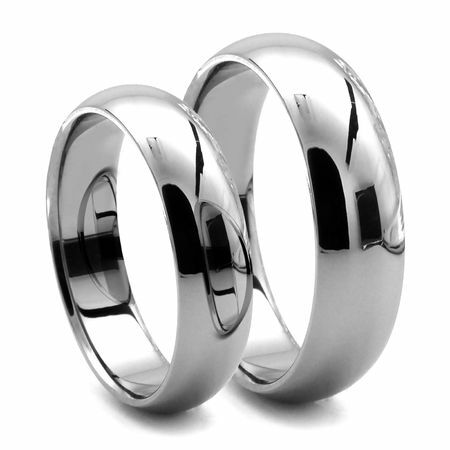 Classic wedding bands in permanently polished, always new looking, TUNGSTEN CARBIDE. Available in three different widths, 4mm, 6mm and 8mm. For ladies who want a more narrow ring, the CLASSICO is available in 4mm width. Best selling width is 6mm, and also available in 8mm widths if you want a wide wedding band. We were looking for durable wedding rings that wouldn't constantly get dirty or damaged as we work with our hands frequently. 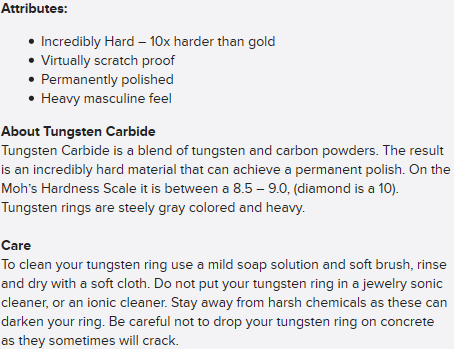 We had a titanium engagement ring that actually got scratched a couple times, so tungsten was a great alternative. We haven't had any problems with adhesives or chemicals affecting the rings, either. A drawback is the inability to re-size the rings conveniently, but that's minor. I couldn't be happier with our wedding bands! I've always been a fan of this website and have owned several titanium rings for several years now, so of course I looked to this site for my wedding bands. This is my first experience with tungsten carbide and I must say I love it! It's lightweight and comfortable and always looks brand new. If it gets a few smudges you just wipe it off and it's good as new. It stays so shiny and smooth looking. I will never waste money on another gold ring. And you can't beat the price of these rings. I really feel like I made out with this purchase. Thanks Mr. and Mrs. Yates! I love my Tungsten ring. Feels great on my finger. I wear it all the time, the ring has enough weight that you know its there but the comfort is amazing. If you are looking for a classic ring this is it.